I recently had to switch from my "regular" to a "field" workshop for some time. 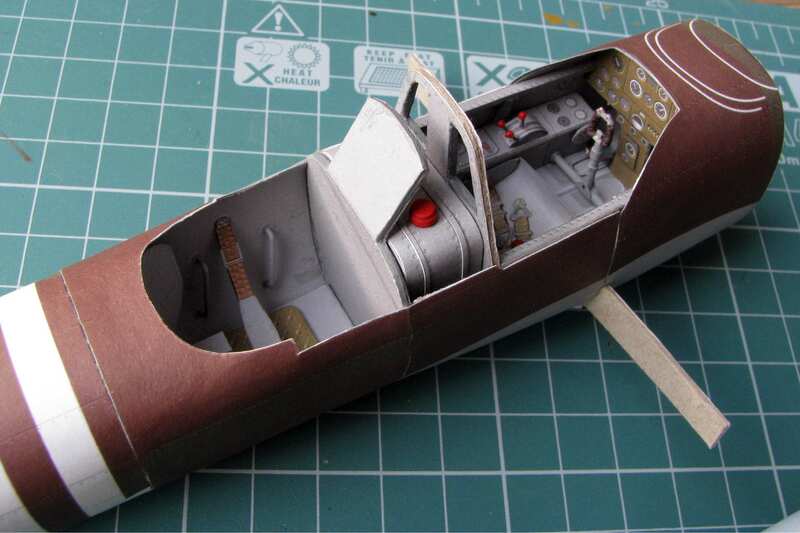 To minimize the number of tools and other stuff to take with me in order to continue tinkering I decided to dig out a paper model that I have started years ago while on a long business trip. It's a GPM 1/33 Il-2m3 Stormovik. 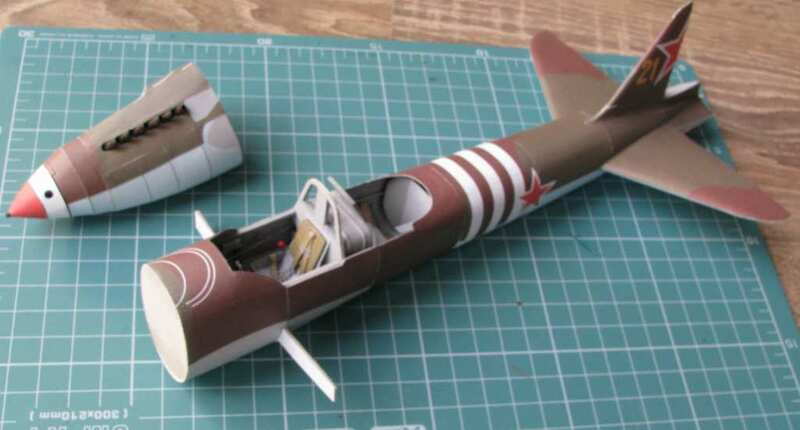 I thought while watching Philo build his Focke Wulf that I'd make some photos and share some tips on building a paper aircraft model - maybe it will help somebody. The trick here is to always make sure the bulkheads that will be glued together have identical shape. This is achieved by holding the two bulkheads aligned face to face and sanding them together on their edges. The bulkheads have two marks on them, one marking the top and the other marking the bottom of the bulkhead. You have to make sure these markings are aligned when sanding and when glueing the skin on the segment. The bottom seam usually aligns with the bottom mark on the segment. Plus you have to make sure the bulkhead is not too big for both of the corresponding segments (it usually is before sanding). You have to sand the pair of the bulkheads until it fits both of the corresponding segment skins. I have also constructed the motor segment with the exhaust, the air intake and rotating prop spinner. The prop blades will be installed later. The empennage is also there and it has positionable steering surfaces - a nice design feature of the GPM model. This is truly amazing. Would love to see the completed version. Thing with this thread here is after TB kindly replied to my post I said OK, let's wait for one or two more responses before replying (very sorry about that, TB!) - and those never came. Shortly thereafter I was forced to shelve the project once again, and didn't think much about this, as there was almost no interest for this subject here in the forums. I have managed to do the inner wing portions before that happened. I hope to get back to this one some day, and then I'll post more photos. Thanks a lot for your interest and have a nice day! I asked santa claus for a paper corsair model but he didn't deliver... this year. If you decide to pick it back up, I'll be watching. You have a nice day as well. I was beginning to wonder if anyone besides Pawel read this .I think more folks should try them .Shoot , you can get a whole forty years stash in one large desk drawer ( till you build them , that is ) T.B. Ted, TB - thanks a lot for your comments here. TB is right, paper models are cool! Ted - if you need any help maybe I could help you find a nice paper Corsair model here in Poland? The one I had picked out was a Huntly's paper warplane. Once I decide to order (I need to build more of my stash first) I'll do more research. I'll keep your offer in mind without a doubt. 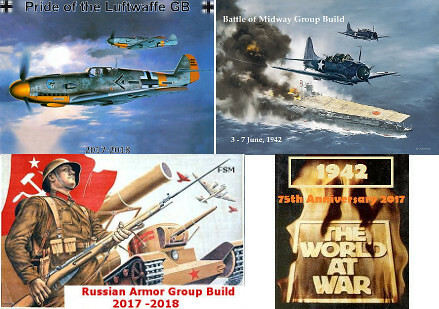 I have looked up the Huntly model - while it's OK, you might want to take a look at some Polish paper models of the Corsair, they are a little more detailed, maybe you'll like them? Thanks for the links. I think i like these kits more. The website has other good stuff too. I'd imagine I'd have to order several things to make the shopping worth it. I've bookmarked the site. Thanks again for the tips. Never have done a paper/card model. Have a Mustang and P-40 in the drawer to try one day. Will keeep an eye on this when you get back to it. That cockpit is truly amazing. I would also like to see the finished product. I am also interested in the tools you use. Thanks for posting. goldhammer - let's see when I can get back to work on this one. ManCityFan - thanks a lot for your kind words! 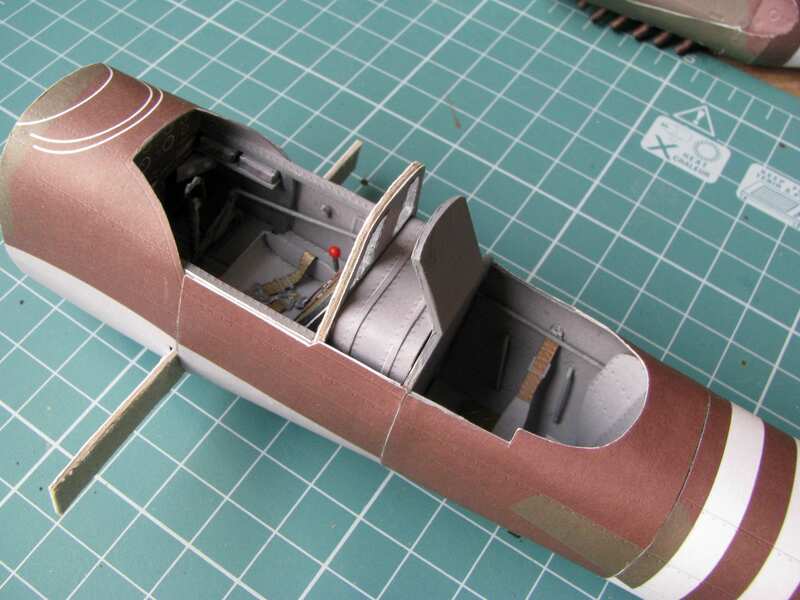 As for the tools, you don't need as many as for the plastic models, that's why I take my paper model with me, when I'm on a business trip lasting more than two or three weeks. The base is of course a pair of good scissors, then you need a sharp knife, the one with segmented and narrow blade works really well. A tube of white glue and a small stick for applying it, and a bottle of CA take care of glueing. A pair of tweezers for handling small parts, and that's almost it. A sanding block comes handy, too. Then you often can use some wire, with good needle-nosed pliers for bending it and maybe some fine drill bits for making holes to put the wire parts into - but in a pinch those drill bits can be replaced by a needle or hot wire to burn the holes through. A fine brush and some acrylic colours can also be used. Again, in a pinch you can only use black paint. And that would do it - fits into a small pouch that can be comfortably carried in a suitcase, and the finished subassemblies are carried in a shoe box.